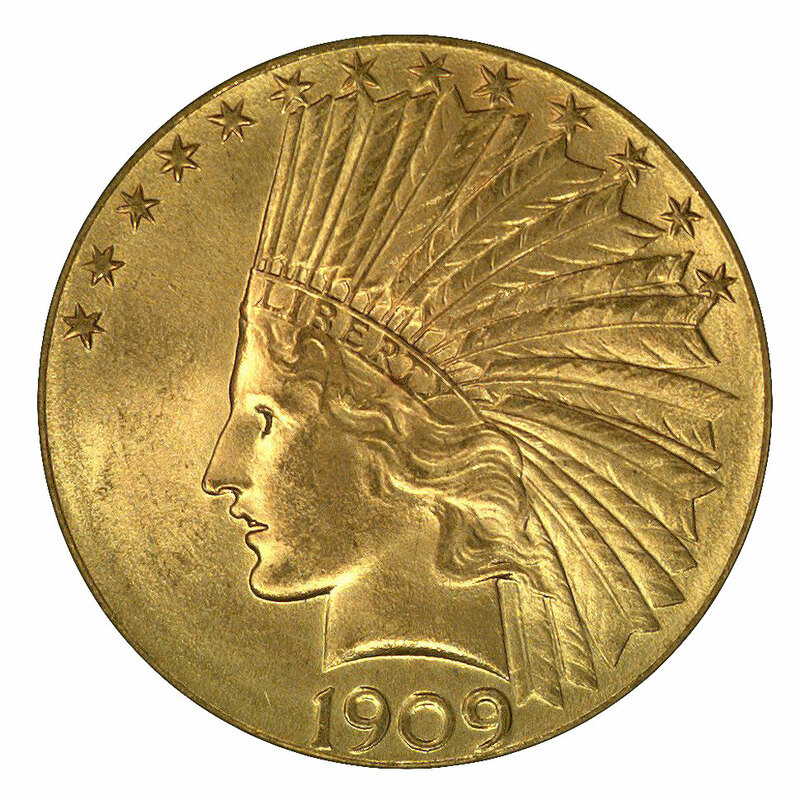 The portrait of Liberty seen on coins of this type originally was designed by sculptor Augustus Saint-Gaudens as a bust of Nike used with New York City's monument to General William T. Sherman. The great sculptor intended to incorporate into the design of a new one-cent piece, though it appeared also on a pattern double eagle dated MCMVII (1907). At the request of President Theodore Roosevelt, Saint-Gaudens adapted this splendid bust for the ten-dollar piece through the addition of a Native American headdress. Though the artist considered this last feature a bit trite, he wasn't about to deny the wish of his patron. The Indian Head eagle series comprises two basic subtypes. These include coins struck in 1907 and 1908 without the motto IN GOD WE TRUST and those issued from mid-1908 through 1933 which carry this motto. One of each typically is enough to suit most collectors, as the complete date/mint series includes three issues that are quite rare and expensive: 1920-S, 1930-S and 1933. 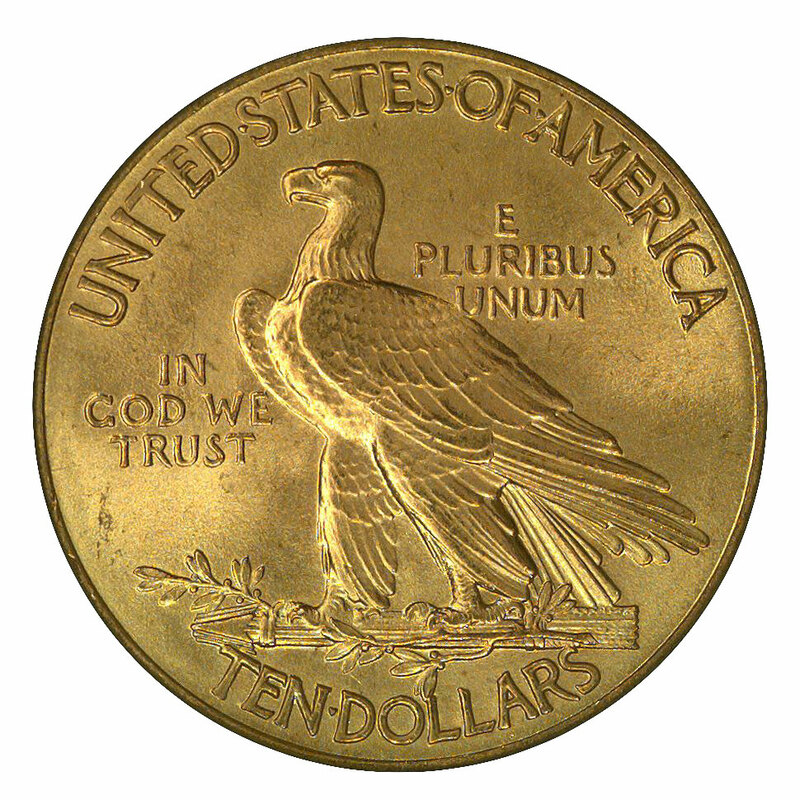 With the exception of the very useful half eagle ($5), 20th-Century United States gold coins saw rather limited circulation. Worn pieces typically became that way as the result of frequent movement between vaults or from use as pocket pieces. Indian Head eagles are rarely seen in grades below Extremely Fine, though The Official American Numismatic Association Grading Standards for United States Coins features text and photographs illustrating this type in grades as low as Fine. 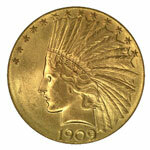 Aside from a handful of dates, however, most coins of this type show little price spread in grades below mint state. For the typical type collector, an uncirculated coin is desirable, and both the "No Motto" and "With Motto" subtypes are common in the lower mint state grades. The 1907 and 1908 issues without motto have a soft, undefined look that an inexperienced collector might interpret as wear. These coins more accurately reflect the style implemented by designer Saint-Gaudens and his assistant Henry Hering, who performed the actual hands-on sculpting. The U. S. Mint's chief engraver, Charles Barber, deemed this softness undesirable, and the lines were sharpened on both sides when the motto IN GOD WE TRUST was applied to the coin's reverse midway through 1908. Gold is naturally quite bright and lustrous, so the main determinant of grade when examining an Indian Head eagle is the number, location and severity of contact marks and abrasions. Since another of gold's qualities is its natural softness, even when alloyed with copper, such flaws typically are very common on gold coins. The larger and heavier the coin, the more likely it will suffer from contact with other pieces. Consequently, the Indian Head eagle seldom is found in grades higher than MS-65. The majority of these gems are concentrated in a handful of relatively common dates: 1907, 1910(P), 1910-D, 1911(P), 1915(P) and, most especially, 1926 and 1932. All other dates in this series can be considered scarce to rare in gem condition. Deep marks or abrasions on Liberty's face and the eagle's head are particularly undesirable and are the ones most likely to result in downgrading. Marks within the open fields also have a significant effect on a coin's grade. Likewise, contact marks that obscure part of the date or mintmark can be critical, depending on how obvious they are. Given their stable nature, gold coins are less likely than others to tone. When toning does occur, it generally appears as a faint, reddish tint from the copper alloy. Thicker concentrations of copper near a coin's surfaces may cause vivid red spots, and the typical hobbyist finds these spots objectionable. Though these red spots can often be removed with a quick dip in a mild acid bath, many collectors find such accents quite charming. It's generally best to leave gold coins as you find them, since harshly cleaned or polished examples are shunned by experienced collectors, and grading services will not certify such pieces. Coins exhibiting a few light hairlines from a gentle rubbing still are eligible for certification, but will be downgraded in proportion to the severity of the lines.